fresh.beautiful: the skin studio is about providing a natural and non-invasive approach to cleaner, healthier and brighter skin. 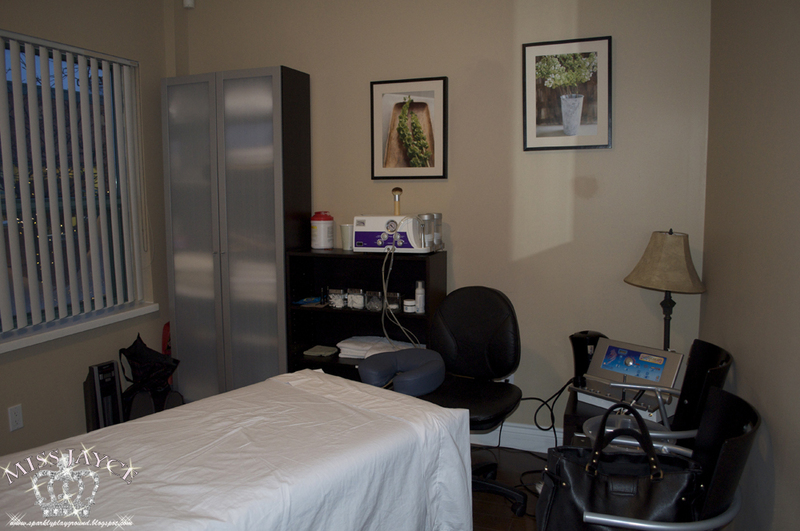 we focus on understanding your personal skin issues and determining its needs. 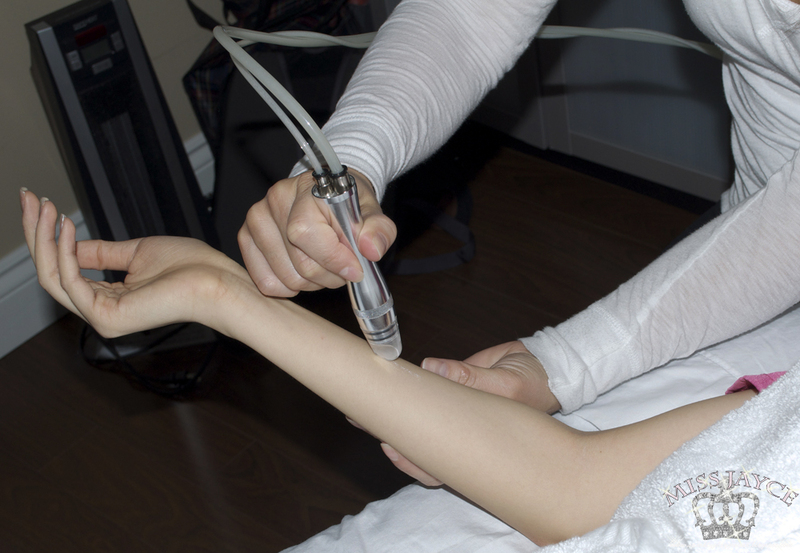 our end goal is to develop a special skin therapy tailor-made just for you. to book an appointment with fresh.beautiful: the skin studio, please email freshbeautifulskin[at]gmail.com or contact us at 416.727.1754.
reap the benefits of both crystal microdermabrasion and cold laser light therapy. together, the treatments will reveal newer, brighter skin, and then hydrate and protect. 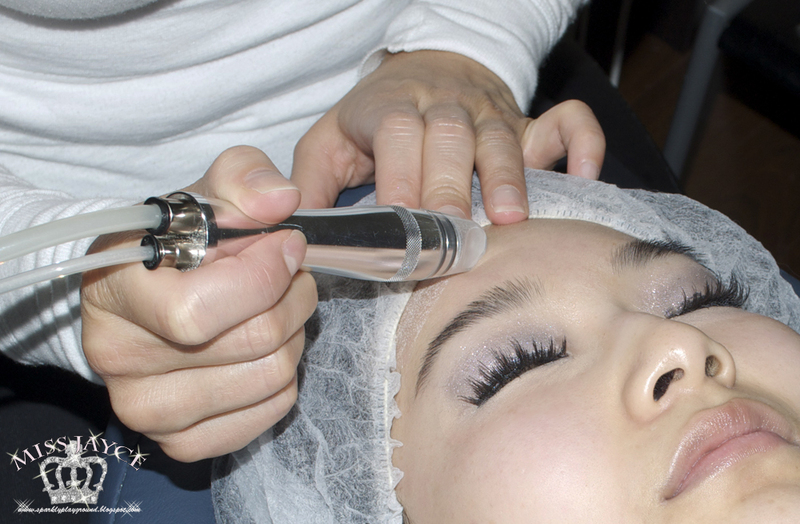 using both crystal microdermabrasion and cold laser light therapy in tandem with one another ensures that we renew and nurture the skin with each session. with crystal microdermabrasion, we are removing the outer layer of skin that has been damaged by the elements, revealing a newer and brighter looking layer. 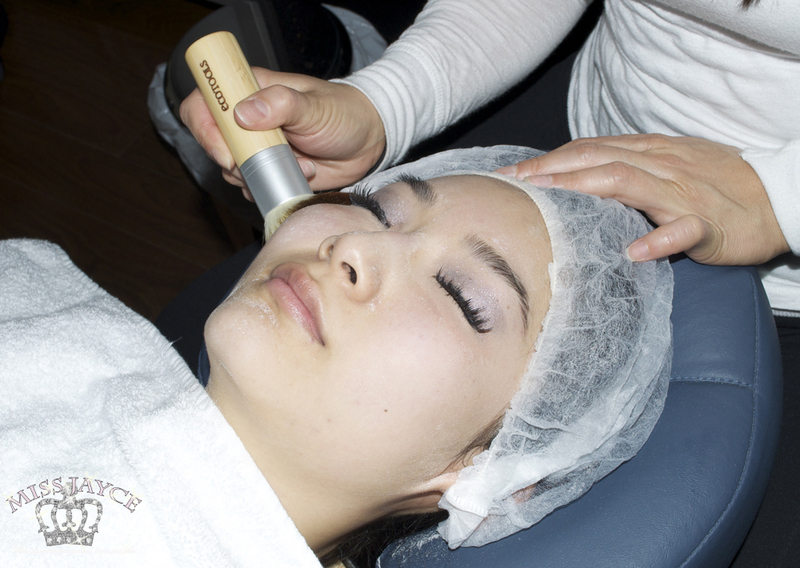 the end result is a more even skin tone and a reduction in the appearance of large pores, fine lines and scars. with cold laser light therapy, we are nurturing and nourishing the skin, helping moisturizing ampoules and gels penetrate to the deepest layer of the skin while addressing common skin issues like dryness, rosacea, and acne. 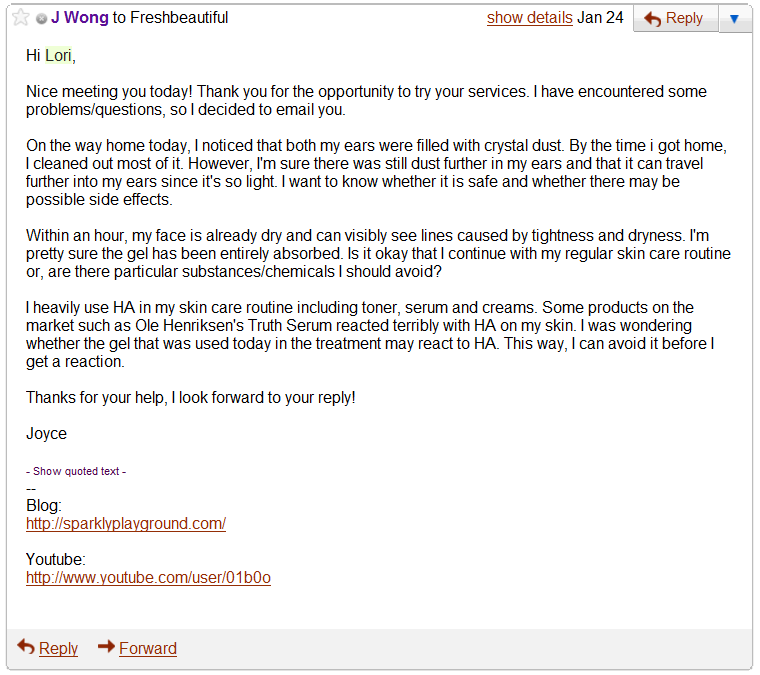 you can also email your inquiries by sending your message to freshbeautifulskin[at]gmail.com. 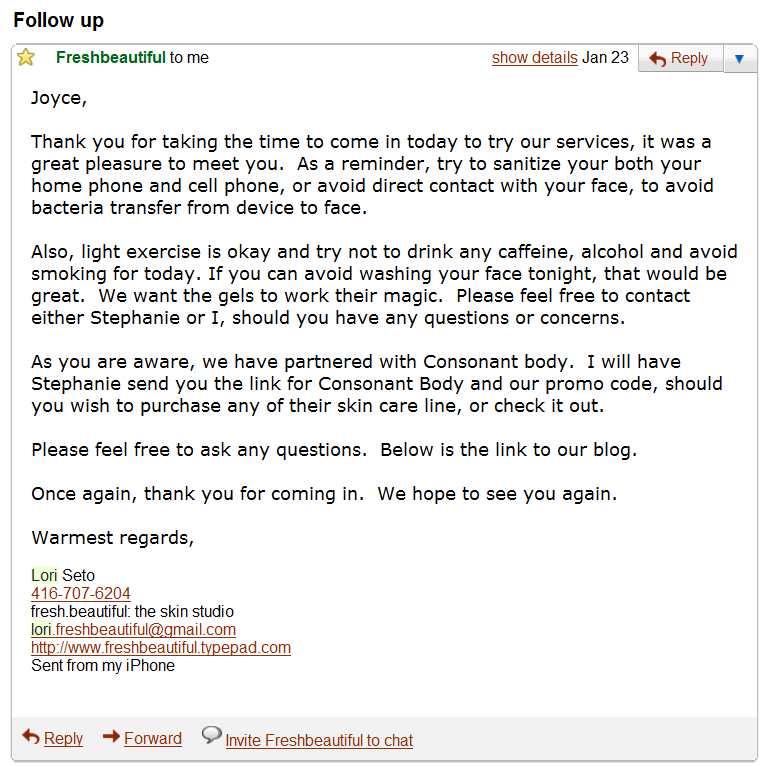 I actually came across this opportunity to try out fresh.beautiful's service via a tweet and I contacted them about it. 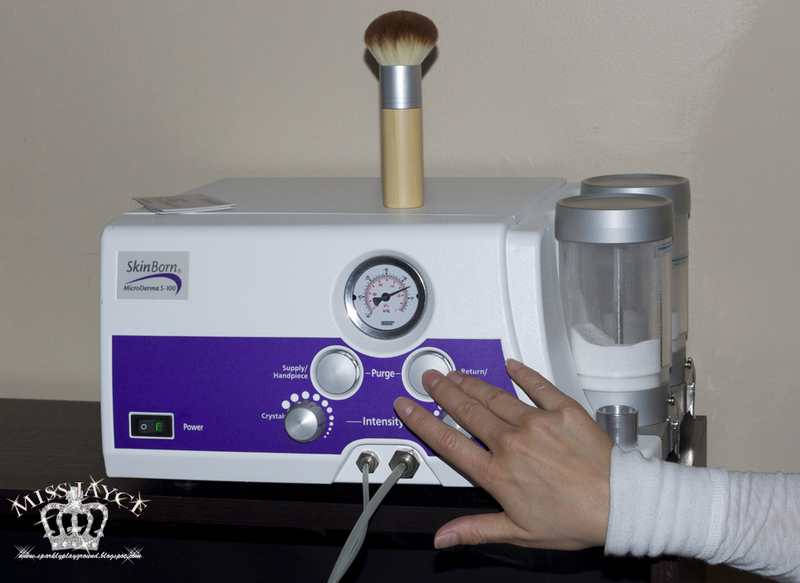 Simply said, "fresh.beautiful studio is new to the Toronto area and are offering Toronto-based beauty and lifestyle bloggers a free 40-minute session of crystal microdermabrasion and cold laser light therapy in order to help us get the word out." So I booked my appointment with them and was very excited to try it out. I've been going to an Asian beauty spa place to do my facials (every 2-3 weeks) for more than 2.5 years now, so this is my first time to try a beauty studio or facial place that is possibly more catered for westerners. I usually buy packages which includes everything such as cleansing, exfoliating, extraction, anti-aging facial massage, neck-shoulder-back massage, diamond microdermabrasion, frequency and mask. Of course, not every single item is done is one session but because everything is well planned out and scheduled for me. I purposely skipped one of my own personal facial sessions which was supposed to have diamond microdermabrasion so that my skin won't be heavily "skinned" when I try out crystal microdermabrasion at fresh.beautiful. So the date of my appointment arrived, I was super excited! This is the room where I got my services from. It was very quiet, peaceful and warm (it was FREEZING cold that day on Jan 23). Lori was friendly and approachable. She also welcomed my boyfriend who came along to take pictures for me. We also had short conversations about how fresh.beautiful became to be; where they got the machines and training involved; how everything is sanitized; whether I had procedures as such before and whether I was pregnant because there will be laser; and so on. So anyway, let the procedure start!The appointment was at 5:15pm, and I had errands during the day so I arrived with full make up. I wasn't told not to have make up or anything and I have always arrived to my regular facial place with full on make up. I realize that I would have to get my make up removed but for pictures sake, and I didn't want to look as if I had no eyes, I said "Please remove everything but my false eyelashes"
To me, it's pretty simple because all you would need to do is or what I expected was:1. Use a cotton ball with make up remover to remove my eyeshadow.2. Q-tip with make up remover to remove my eyeliner.3. Cleansing oil or Gel cleansers to remove my make up. I didn't want to be come off as bossy, so I just followed her instructions and be pampered. She began by using a warm and moist towel to wet my face and then using a foaming cleanser to clean my face and remove make up. During the foaming cleansing process, she explained to me that they have a partnership with Consonant Body and the foam cleanser right now is one of their products. Lori also told me that if I purchase through them, I can get 15% discount. Lori told me to expect a tingling effect during the foam cleanser process. I found the foam cleanser really harsh for my skin. I felt as if it was like needles poking me, so I kindly told her this is not suitable for my skin and asked whether there may be a cleansing oil. She asked me, "What is a cleansing oil?" I explained it to her and then I also added that I came in wearing BB cream, so usually it's best to remove with cleansing oil or gel cleansers because the specific BB cream I was wearing is hard to remove and my skin is very dry. Lori also didn't know what a BB cream was so I explained that to her as well. So the above photo is my face right after foam cleansing, bubbles still there and not rinsed yet. You can see that my eye make up and concealer is still there while BB cream and blush is gone. At this point, I knew a bit that my face is like so, but I wasn't entirely sure since I didn't check my face with a mirror at every step! She first tested the strength of it on my arm before moving onto my face. Ya, I think you can tell by the facial expressions of my face, I was in pain. I was tearing up in my eyes. Finally after testing the strength again for 3-4 times, it was good to continue. However, that area of my skin still hurts. I'm not entirely sure of the word to describe, but you know when alcohol touches a scab and it kills? That feeling. I'm pretty sure, my skin was damaged. Sidenote, I do believe that in some aspects, Asians do have VERY fragile and thin skin. So this may be a reason why I'm super sensitive. I didn't say anything about this because I didn't want to be picky anymore. 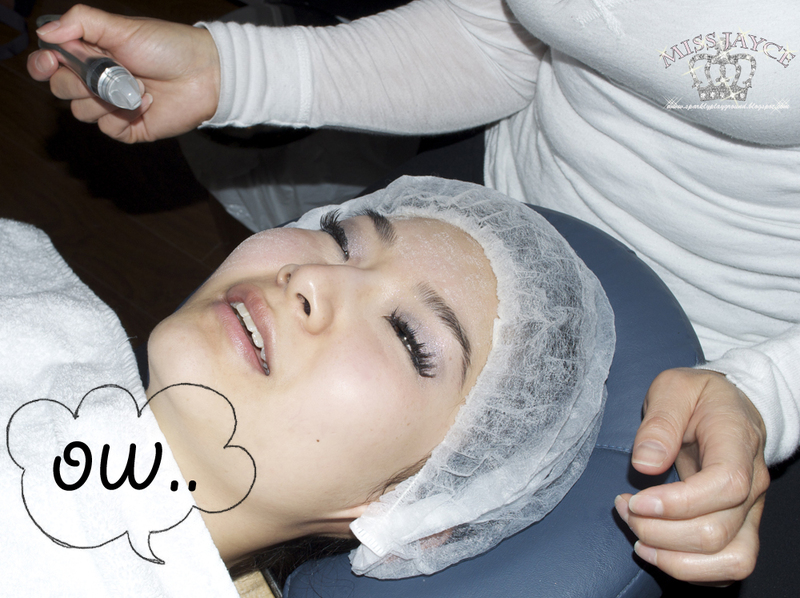 However, she was doing crystal microdermabrasion with a downward motion. This is a huge NO. You can easily tell by the hand gesture as well in this photo! 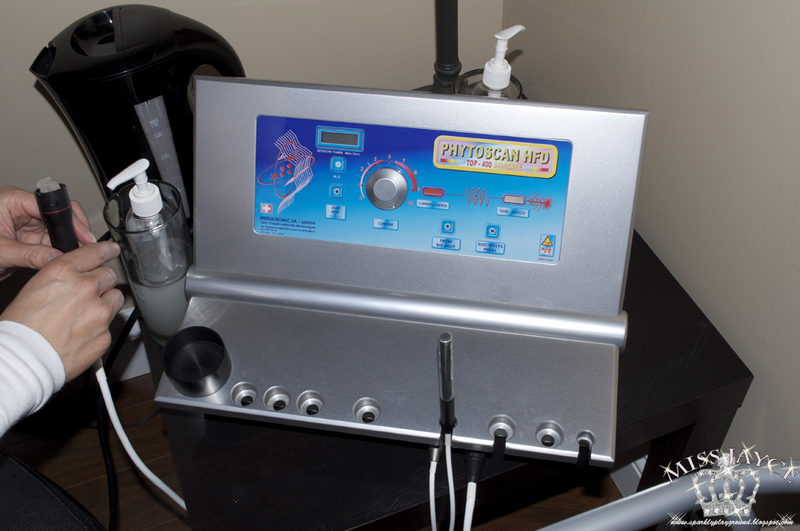 In very simple English, microdermabrasion has an element where it vacuums your dead skin cells. This means that it has a pulling tension. And, preforming this with a downward motion means.... PULLING MY FACE DOWN. To be honest, this is where I was most upset. 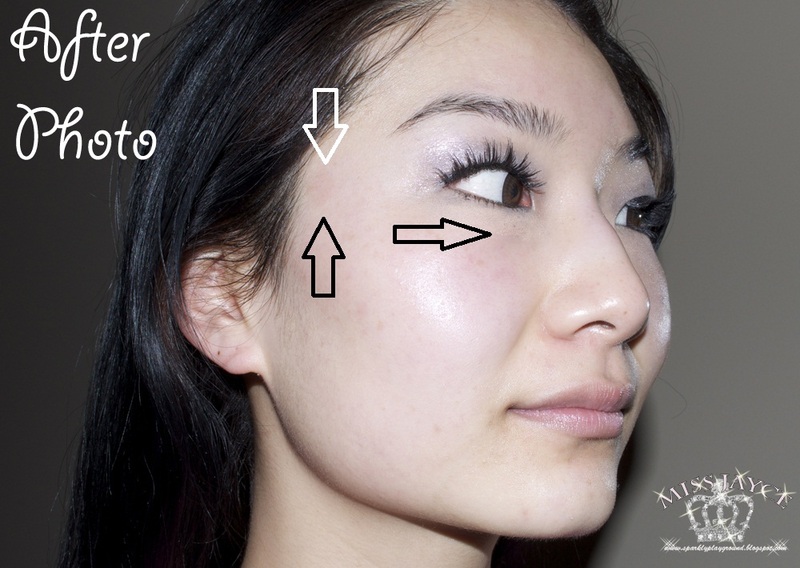 I've done microdermabrasions before and never were they preformed in a downward motion. This promoted a SAGGY face. Do you know how much people spend doing a Face Lift? How many face masks and mud masks out there which promotes Lifting Properties?How many Facial Creams that helps lifts your face?Because, we want to prevent signs of AGING. Finally the crystal microdermabrasion process is finished. She used an ecotools brush to brush of all the crystals. I thought nothing can go wrong at this point but it did. However, I only found out when I got home. Foam Cleansing again, after knowing that I have dry skin and after microdermabrasion, my face was extremely sensitive. This part was quite brutal, feeling like needles poking my face again and this step entirely stripped away all my natural oils. I truly enjoyed this process. It's nice to have this after all the pain I endured. The feeling of this is like having cold stones massaging your face with a gel. I liked this a lot. Afterwards, she massaged my face a bit and then told me she was going to apply a lotion/gel for my blemishes. So usually at my facial place, the lady would apply an overload of cream at the end and massage until its fully absorbed. However, here, the very last step, she used something to gently wipe off the excess. I'm not sure what that something is because it was quite harsh and I still can't figure it out after looking at the above photo. Before I left, Lori told me to not wash my face to let it work its magic overnight. She also instructed me to try my best to not touch my face because its really sensitive and bacteria can easily cause it to break out. That also applied to cellphones where it can have face contact with me. She said there will be a follow up email to go over these details again. When I got home, which was about a 45mins car ride home, there were also immediate results. Which can be summarized by the below emails. 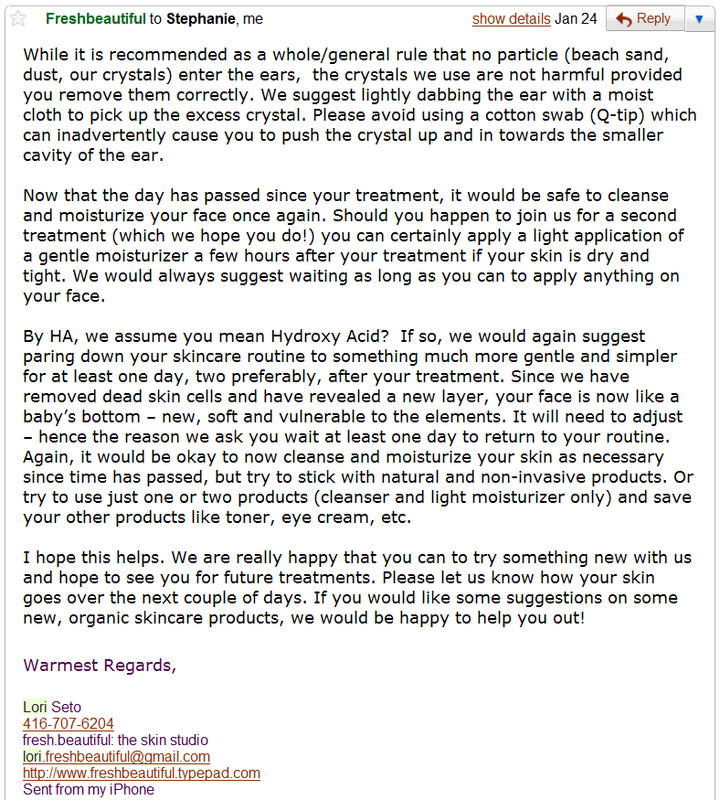 By HA, I meant hyaluronic acid but that isn't so important anymore. I'm very disappointed of course, if I had to pay, I would not only ask for a refund but also a written statement to say that they will be responsible for whatever damages the dust sand may cause. It's only logic right, these dust particles were used to preform microdermabrasion, what if it cuts the inner tissues of my ears? CON: Poor removal of make up. It's a like a foundation, if your first step is a bad job, so will the rest. 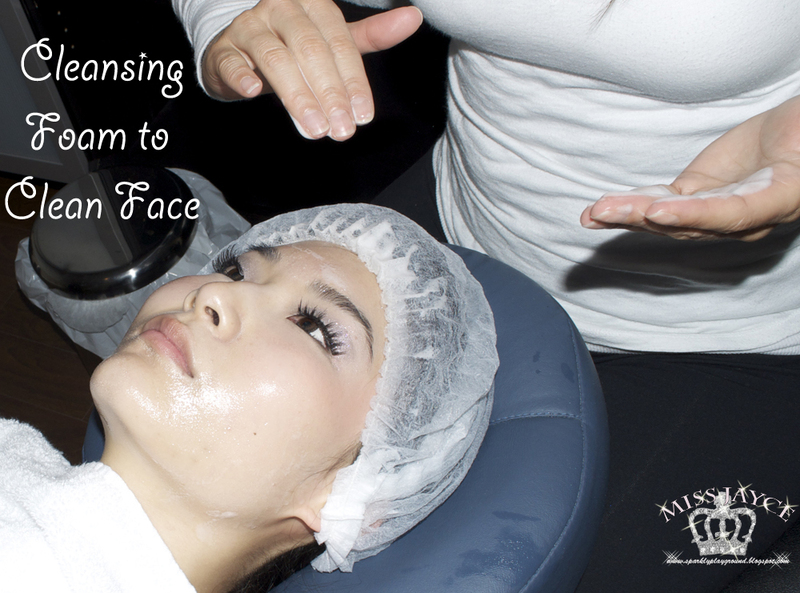 CON: Promoting products is often seen during facial sessions, its nothing new. However, the main goal of this appointment is to achieve the results -- "newer, brighter skin, and then hydrate and protect" This product being used in the first step (especially when this product is not suitable for ALL users) can also bring down the rest. CON: Lack of basic skin care knowledge. In the world of beauty and skincare, everyday is a learning experience. There is so much out there, so I don't expect her to know everything. However, if one is in the position to provide skincare services meaning this is their area of expertise, they should at least know more than me. I'm no expert and I know what is a cleansing oil and BB cream. These are products that can be found in Sephora, MAC, the Bay, Sears and more. This is your face we're talking about, you want to be in good hands right? 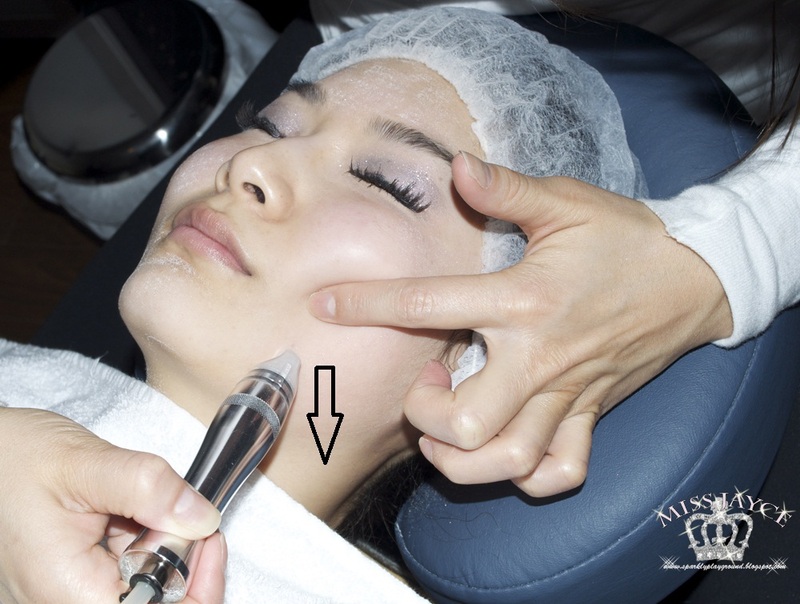 CON: Downward motion during crystal microdermabrasion. Need I say more? CON: It isn't fully equipped (skin care products). 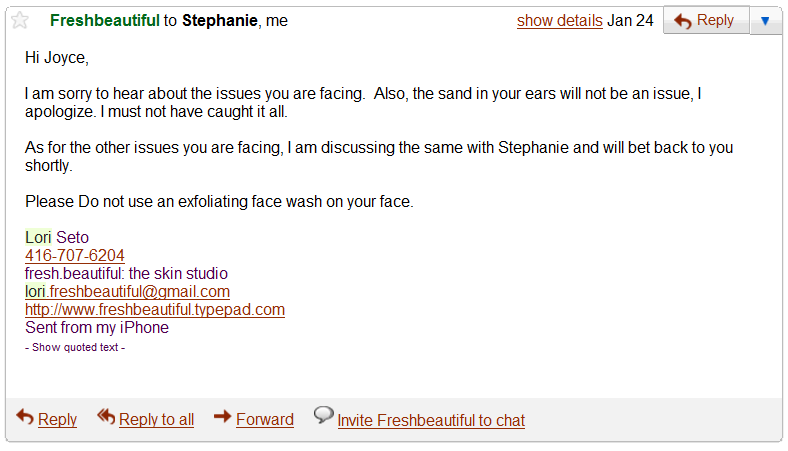 The studio should be ready for customers of all skin types and what make up they have on. It needs to have all those essentials. CON: There was no magic. No results. The magic lasted probably 5 minutes when the picture was taken. If you read the emails above, my skin was dry as ever within an hour. Lines were visible. On top of that, it was during winter times, our heating system overnight will only make my skin drier. I had to carry on with my skincare routine immediately. The result was damaged skin. I booked an appointment to my facial place the next day for rescues. PRO: Customer Service is friendly and polite. I like that there are follow up emails. I like that the overall tone is professional. This is probably by far the longest review ever. It's important to deliever as in-depth as possible to present both sides of the situation. If you just stumbled on this blog and read this. I do strongly suggest you to read this post, where I talked about my thoughts before posting this review.